I don't do vintage...too fussy and froofy (is that a word?) for me. So when my Mom commissioned me to make a card for a Diamond Anniversary AND provided me with the stamp and the supplies she absolutely had to have on the card, I knew I had a challenge on my hands. I had one very pretty Hampton Arts stamp called "Walking down the aisle" and some dollar store bling to use. I had orders to make the card "sparkle like a diamond". Oh boy! I stamped the bridal couple, coloured some key areas with my copics, glittered the veil, flowers and boutonniere and fussy cut the image. Everything was edged with tea dye ink. 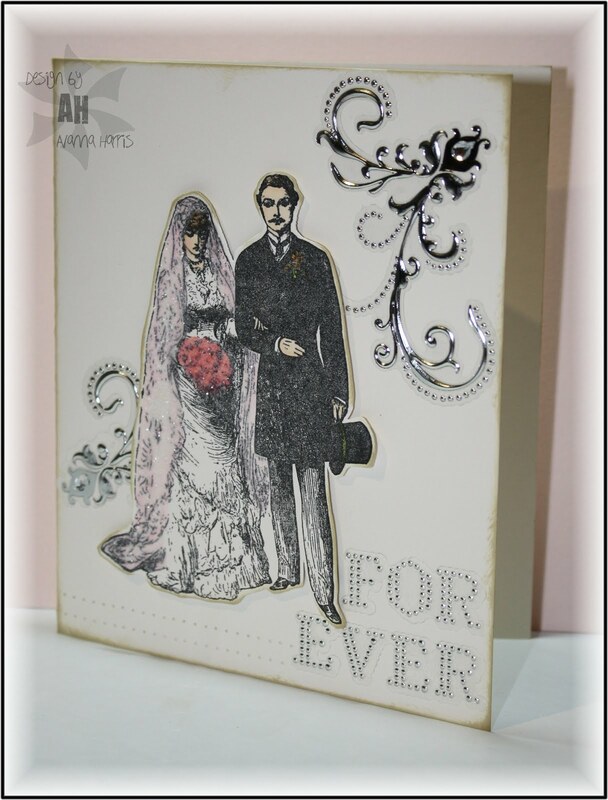 I added some strategic shiny flourishes and the "forever" sticker which I cut in two so it fit better on the layout. I finished the card off with some piercing along the bottom in the empty space. The card measures 5"x6". CAS meets vintage??? What do you think? CAS vintage could be a new name! I'm not a fan of Vintage either but I think you nailed this. It's clean and vintage! Your Mom will be proud. I think you got just right! I love the way your finished design turned out! My daughter in law loves it and wondered if you know where you got the stamp.She would love them as her Thank you's for her shower. Very pretty!!! I love this card - it is absolutely gorgeous. I love the vintage look and you have captured it wonderfully. May I ask a favor of you?